Towering Ponderosa Pine trees surround this Rocky Mountain Cabin located in the beautiful Sangre de Cristo Mountain Range. 52 high mountain lakes hold various types of Trout, and miles of trails lead to them with 5 14,000' peaks providing views that have to be seen to appreciate. 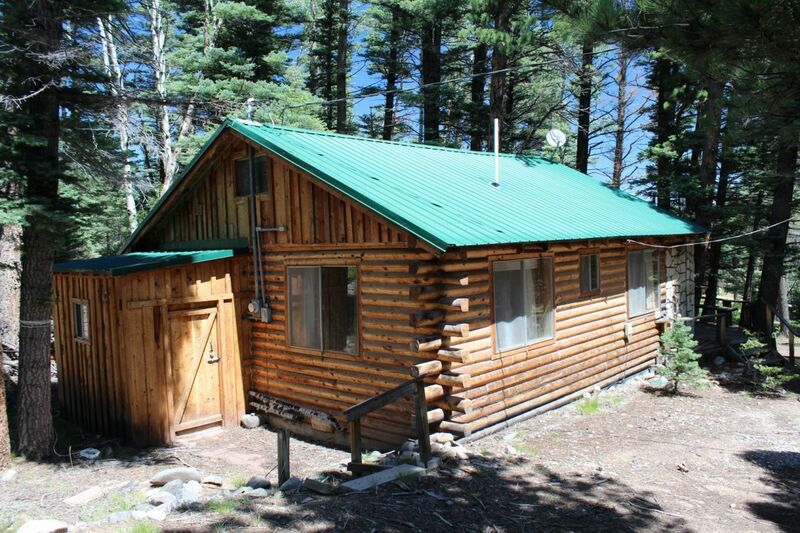 This real log Cabin has 2 bedrooms, a 3/4 bathroom, full Kitchen and a Heatalator fireplace in the Living room. Timber frame style construction of the rafters left room for a small loft that would work great for the kids to play and sleep in. A metal garage has room to store ATV's or other recreational toys. The cabin is set on a concrete stem wall foundation, and has a laundry room accessible from the exterior. Drive into the property is by covered bridge or through a high mountain stream, with lush alpine forest in every direction. A Domestic Well provides cool, clear water to this mountain get away. If a log cabin nestled in the heart of the Rocky Mountains appeals to you, and the sound of the wind blowing through majestic pine tree's strikes a cord, call today to see this unique property and perhaps coffee on the deck of your new cabin while the sunlight breaks through the tree's is not far away!